Mordian 7th Regiment: Heresy Era Dark Angels - Characters and plasma repeater support squad(s) painted! Heresy Era Dark Angels - Characters and plasma repeater support squad(s) painted! Got a fair bit of brush time in over the last few days, as well as some cool new gear - A good combo! I wanted to do a few placeholder character models for the Dark Angels while I await whatever new models may drop with the release of the next book, Malevolence. 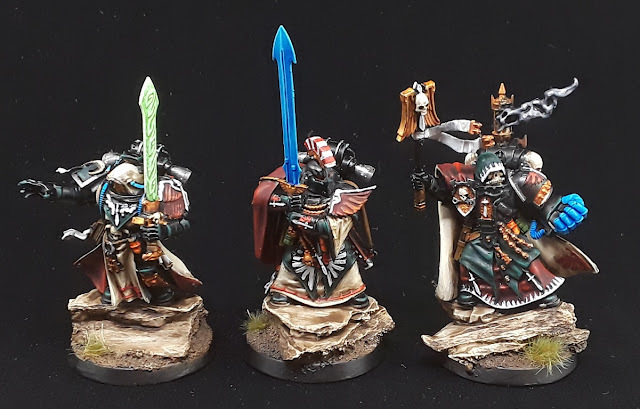 The two Dark Vengeance models got a helmet swap and some Mk.III backpacks to heresy them up a little, while the chaplain basically just got painted as-is. Even so, they're a little over-blinged which reads as a bit more 40k in general. Nevertheless, quite pleased with how they turned out! The plasma support squad was the initial test of the paint scheme using the Vallejo range of substitute colors for the armor, and while they worked out reasonably well, I ended up buying some Incubi Darkness and Kabalite Green which are both about a step darker and will hopefully not be quite so stark on future models. Still researching how I want to do the heraldry thing with the models. As a nod to the fluff, all of the models in the army will have the green right shoulder pad to represent them being Calibanites (and as such filthy dirty traitors, as the situation demands). I'm thinking of going with a common heraldic design to denote squads, with some additional personal heraldry on occasional other areas of the armour. Most of the color plates seem to suggest a mix of red slashes, black and white checkerboard and bone, so will have to experiment with various combinations thereof! So that said, the two squads above aren't done per se - still a fair bit of work to go, but as a proof of concept I think we're on the right track! You may have noticed a bit of an increase in the quality of the photos due to the acquisition of a proper light box (finally). I've been experimenting with backdrops and techniques over the last several months as you may have noticed, and finally broke down and bought a Foldio 2 based on the comments and reviews of several fellow bloggers - thus far I have to say I am quite impressed! The adjustable overhead lights make getting good bright white light at the intensity desired, these were taken at about half brightness as the full chat was blowing out the pics. 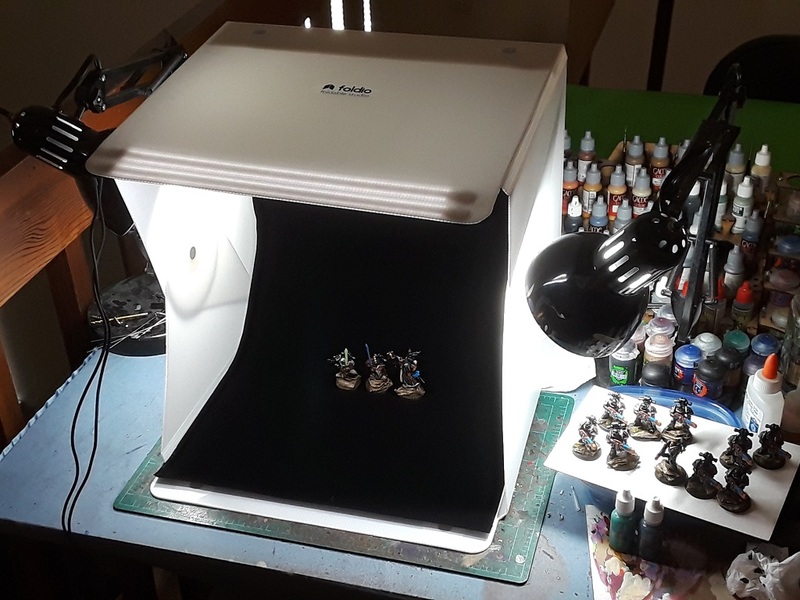 The translucent material of the box itself means that I can position my stand lights to either side and get some nice secondary diffusion. Now if only buying new gear automatically granted a commensurate boost in painting skill! Hah! Indeed - I'm going to need to keep a lint roller or packing tape on hand to pick up any errant schmutz that ends up on the black background for sure! Great army, it is not to often one sees a pre-heresy DA army so I am eager to follow your progress. 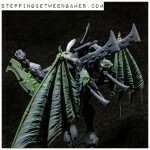 I am however not to sure I like the green highlights on the black. Somehow it does not look like they belong together. Black is a really tricky color to get right. Generally I think that it is easier to make it a very dark shade of some other color that you can work with it as normal using dry-brushing, edge highlighting etc and then wash it gently with a black wash or watered down ink. This way it will look black, especially if there are contrasting color. But in the end that might be to much work and it might be that it is the closeups that magnify the effect. Looking forward to see the rest of the army. Cheers! Aye, the greenish black is an experiment, and the edge-highlighting on the plasma squad is a bit more abrupt than I'd like. Much happier with the new colors (to be seen in an upcoming post)! They look great but . . . . . . Spreadsheet . . . . . . spreadsheet! Haha! I'll be sure to include one in the next update! Yeah, I have a Foldio too, I also use free to download Picasa Photo Editor software to adjust balance and retouch the odd rogue dog hair on the backdrop. Love the characters, and those Plasma Guns look the business mate. Thanks very much! I'm pretty jazzed by the Foldio so far! Cheers! It's been a fun project so far! Coming along well and the pictures are looking good. Thanks man! Next step is seeing how the scheme translates to a vehicle. Always a dicey proposition! Wow! Those are a great start - really liking the scheme so far mate. Very nice! Is the Foldio tall enough to accommodate a Knight and wide enough for something like a Spartan?